Depending on your interests and tastes, a visit to Dumbo can land you just about anywhere. We’re talking atop a carved horse on Jane’s Carousel, watching an avant-garde masterpiece at St. Ann’s Warehouse, grabbing a thin-crust slice of heaven at Grimaldi’s or Juliana’s, or picnicking on a quiet corner of Brooklyn Bridge Park. At the epicenter of the neighborhood, Empire Stores is hard to miss. Swing by to catch top-notch live music, sip a signature Negroni at Cecconi’s, and enjoy a pre- or post-shopping bite at the Time Out Market food hall or one of the many fine-dining establishments. And while you’re here, don’t miss the rooftop garden for the awe-inspiring view of the New York Harbor and Manhattan skyline. Wherever you find yourself, you can bet that this destination will not disappoint. An acronym for Down Under the Manhattan Bridge Overpass, Dumbo received its moniker back in the 1970s from local residents and artists hoping the “uncool” nickname might help keep the historic waterfront neighborhood a secret. Well, the secret’s out—and for good reason. For years, Dumbo has had a thriving art, culture, and foodie scene. And with the development of Brooklyn Bridge Park—an 85-acre sprawl of lushly landscaped greenery, six piers, adventure playgrounds, miles of bike and walking paths, and world-class recreational spaces along the East River waterfront—and the revitalization of Empire Stores, Dumbo continues to up its cool factor and earn its place as the most must-see, must-live, must-selfie neighborhood in Brooklyn. Like all of Brooklyn, Dumbo is ever evolving. Wander the Belgian-block streets. Follow the well-trodden paths to the docks. Stare starry-eyed at the view in every direction, day or night. Westville is a traditional American eatery and a staple amongst Manhattan-ites and prides itself on high quality, inexpensive comfort food. It's first Brooklyn location sits in-between the Brooklyn Bridge walking path and the Brooklyn Bridge park. 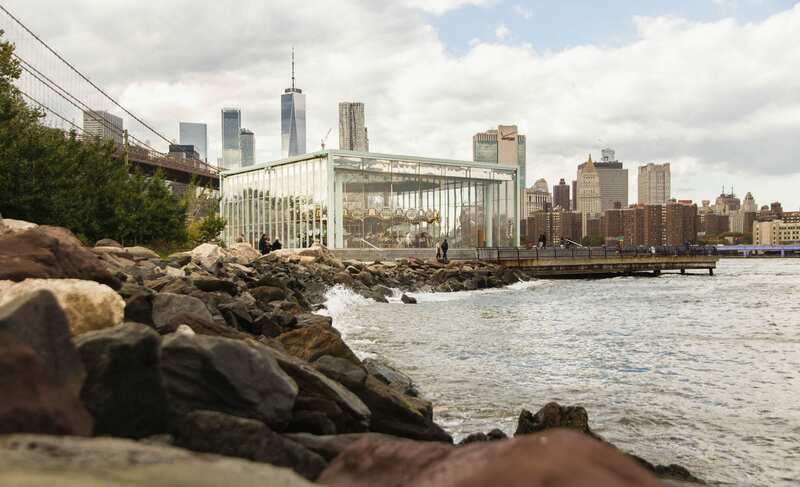 Nestled under the Brooklyn Bridge with sweeping views of the New York skyline and the Statue of Liberty, The River Cafe has been a favorite destination for New Yorkers and visitors from around the world who demand the highest level of cuisine since 1977. Sweetgreen is a destination for simple, seasonal, healthy food. They believe the choices we make about what we eat, where it comes from and how it’s prepared have a direct and powerful impact on the health of individuals, communities and the environment. For 34 years, St. Ann’s Warehouse has commissioned, produced, and presented a unique and eclectic body of innovative theatre and concert presentations that meet at the intersection of theatre and rock and roll. The largest North American store, and second Brooklyn location, of this Amsterdam-based fashion brand. One Girl Cookies serves delicious treats (try the whoopie pies! ), breakfast items, caffeinated beverages, and savory lunch staples, plus wine and beer in the evenings. OddFellows Ice Cream Co. offers an ever-growing list of small-batch ice creams, vegan frozen desserts and sorbets – over 400 flavors so far – made in their Brooklyn kitchen. Located in Brooklyn Bridge Park, Jane's Carousel is a completely restored historic Carousel made by the Philadelphia Toboggan Company in 1922. Ignazio's is a pizza restaurant located under the Brooklyn Bridge. They offer a wide variety of specialty pizzas that will satiate any pizza lover. At Equinox, panoramic views and inspired design elements combine with elite programming for a health and wellness experience as elevated and cutting-edge as the neighborhood it calls home. Celestine is an Eastern Mediterranean restaurant located on the DUMBO waterfront, just under the Manhattan Bridge. The Brooklyn Ice Cream Factory offers simple, pure and delicious ice cream. Production is done in-house in small batches. Enjoy a dining experience composed of locally sourced, seasonal ingredients that are prepared with a focused simplicity and elegance, a new French-inspired restaurant from former DB Bistro Moderne alum Laurent Kalkotour, Alexander LaPratt, and Leslie Affre. The international menu at 7 Old Fulton, ranging from classic American to Italian, French, and Spanish with dishes such as Veal Tuscany and Shrimp Saint-Tropez, is a perfect indulgence before or after enjoying the neighboring scenery. Luke Holden and his team are serving delicious and affordable lobster, crab and shrimp rolls, crab claws, chowders and beers -- all fresh from Maine! Just a short walk to A, C, and F train accessible subway stations, Empire Stores is one stop away from Manhattan to the west and the Metrotech/Borough Hall transit hub to the east (2, 3, 4, 5, and R trains). Empire Stores offers direct access to the Brooklyn Greenway, a network of protected bicycle paths, local rental and repair shops, and a number of bike-share stations. The existing B25 bus stop along Water Street drops off and picks up passengers immediately in front of Empire Stores, providing a direct connection to Downtown Brooklyn, Brooklyn Heights, and beyond. DUMBO’s dedicated ferry stop affords Empire Stores a reliable and affordable transit alternative to Manhattan, Brooklyn, and Queens destinations. More than 1,200 off-street parking spaces are currently available or in construction within two blocks of Empire Stores.